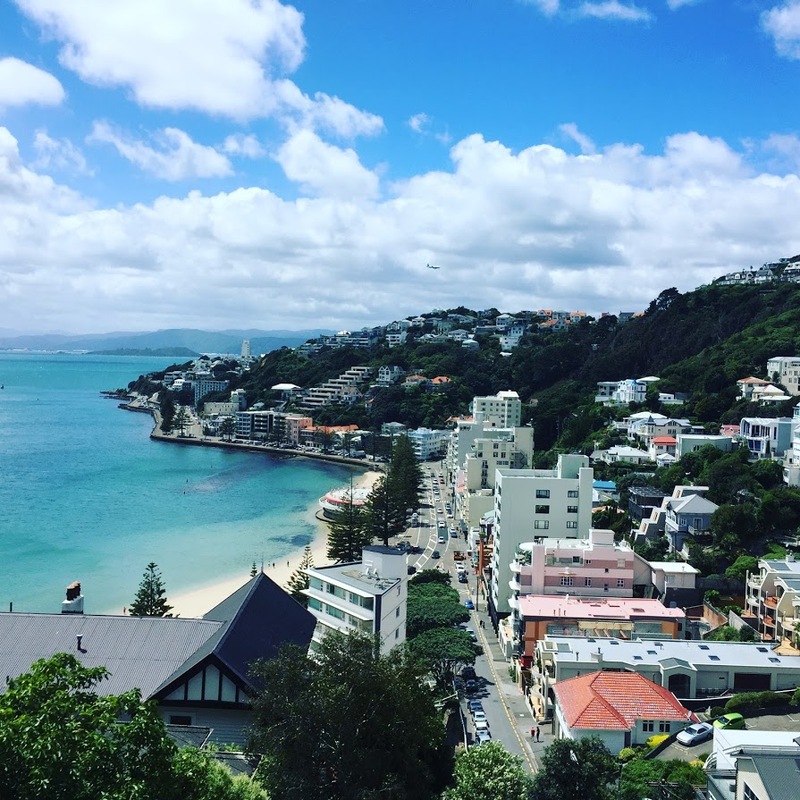 Wellington is the capital city of New Zealand. We were excited to explore all the amazing things to do in Wellington. Best of all everything we wanted to do we could do without a tour and at minimal cost. The view from the top with the cable car in the background. We were the first group off the boat to avoid the crowds we headed up in the Wellington Cable Car to the top. The cost was $5 NZ/ pp for a one way trip. There was a spectacular view of the city from the top. Highly recommend getting up early to check out Botanical Gardens with few people around. There was no cost to visit the Gardens. Our plan was to slowly walk down through the Botanical Garden paths back to the city. There are many hidden areas where you can curl up with a book. (If only we had more time.) It is a gem in a busy city. At the end of the Botanical Gardens you past through a old cemetery on your way down to the city. Well if you don’t know, I love cemeteries. I think it is amazing to look at grave sites and read head stones. They provide small pamphlets to read about the people that are buried in the cemetery. The crazy thing about this old cemetery is that there is a major highway passing through the middle of the cemetery. I wonder if they had to relocate graves for this highway. As a pedestrian you walk over a large bridge to the other side of the cemetery. After you exit the cemetery it is hard to miss the Beehive and Parliament Buildings. The Beehive is an impressive large round building that appears grand while standing next to it. We did not go inside but took pictures from the outside. We were visiting on a Saturday morning so there were very few people around the buildings. Next we were back down in the city where the cable car starts we walked through the city on our way to Cuba Street. Cuba Street is very similar to Madison’s State Street. It is pedestrian friendly with lots of unique shops and restaurants. There is energy from people wandering the streets. The people watching is quite good here too. We ask a shop owner a recommendation for a coffee shop nearby. We soon found out that coffee shops have a cult-like following. After listening to all the pros and cons of nearby coffee shops we headed to one called, Milk. Milk was excellent coffee shop. Mr Travelista considers himself and evolved coffee drinker and it was two thumbs up from him. We took the coffee to go (take away) and checked out all the amazing murals as we walked the back streets to the Te Papa Museum. First off, we don’t love museums. I know! But were were very impress with the Gallipoli exhibit. If you don’t know the story of Gallipoli don’t worry either did we. It is not something most Americans know about. The exhibit tells the story of Allies which included New Zealand soldiers during WWI fighting the Turks Ottoman Empire in Gallipoli. It was a long battle that kill thousands of people. The battle went on for a long time with no clear winner in the end. To this day they still commemorate the day with Anzac Day and Red Poppies. If you ever have the chance to visit Te Papa make sure you spend some time exploring. After we finished at Te Papa across the parking lot are the Wellington boat houses. The purpose of these building to to store materials for your boat like oars or life jackets but we also saw building materials as people were fixing up older boats. We loved colors of the boat houses and the walk along the harbor on our way up to Mt Victoria. Most people would take a taxi up to the top but if you are physically fit I would recommend that you hike up to the top. While the views at the top are amazing you also get wonderful views as you hike up. You can also watch airplanes come in for a landing at Wellington airport as you take in the birds eye-view Although it is windy at the top it is well worth the time to make the climb. On our way back down were took another path and ended up getting lost but silver lining is we stumbled across a film location for the Hobbit. Once we made it back down Mt Victoria we headed back to the ship as it had been a long day walking around Wellington. Other than the first cable car we took up to the top, we did not use any other transportation other than our feet. Next up we finally head to the South Island of New Zealand to explore the small fishing village of Picton. Stay tuned.